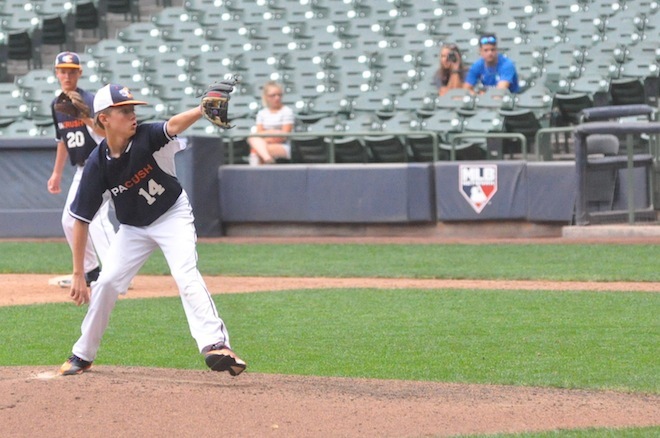 From left: Gage Peterson, Jake Roberts and Zachary Kazumura finish warm-up drills between innings during the MYBL state championship (Jason Arndt/The Report). 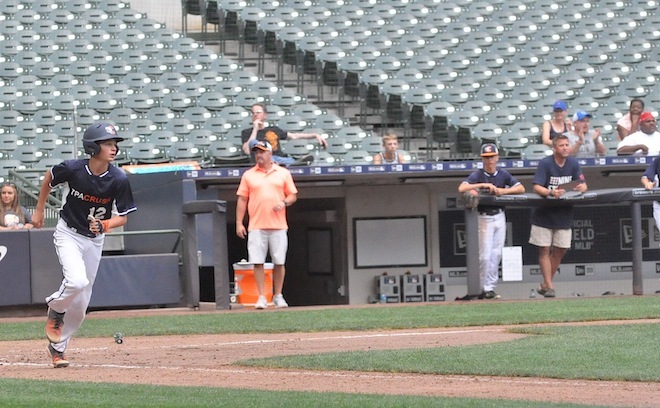 After defeating Prospect Training Academy 6-1 in mid-July to claim a Major Youth Baseball League Premier South title, a group of area boys realized a dream on Tuesday, when they took the field at Miller Park in Milwaukee. 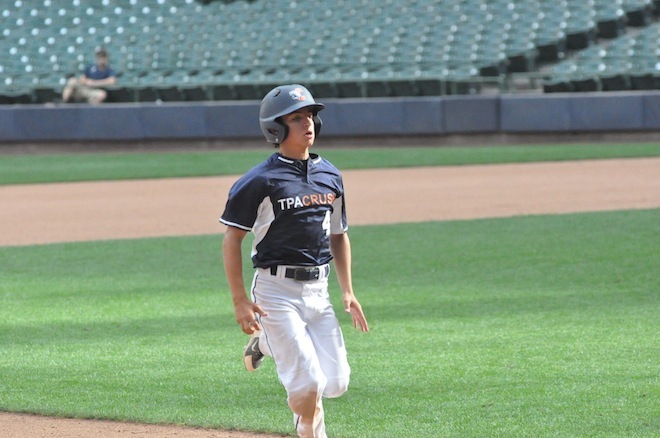 Triple Play Academy Crush 14U, which entered the contest 35-4, played Oconomowoc/Delafield-based Titans Select for the state championship. Although the team dropped a 4-3 decision, a handful of parents and athletes came away with memories to last a lifetime, according to coach Steve Reiter. 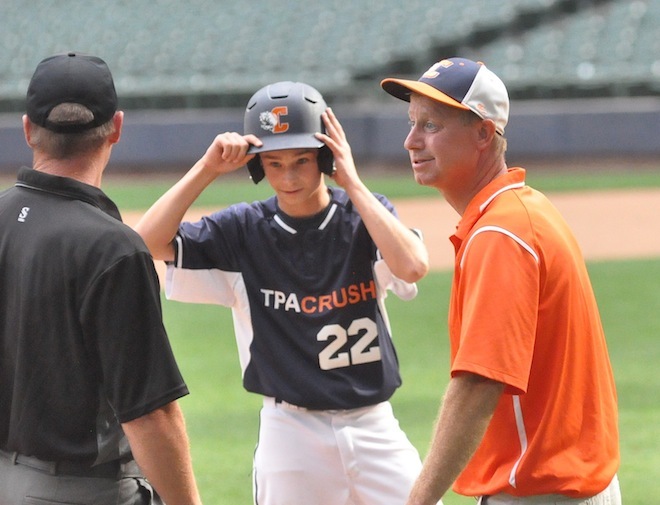 TPA Crush, a team with a training facility in Antioch, Ill., played some of its home games at either New Munster Ball Park or Westosha Central High School. 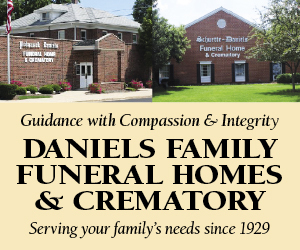 The team consists of players from Bristol, Burlington, Kenosha, Salem, Silver Lake and Wheatland. Each player will feed into one of the following high schools: Bradford, Burlington, Burlington Catholic Central, Westosha Central or Wilmot. 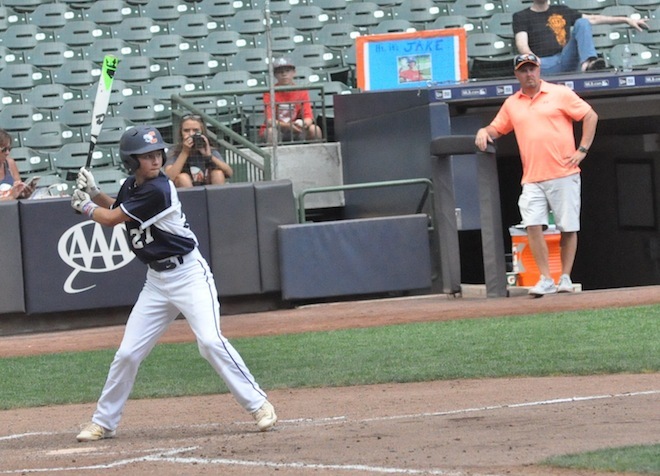 In alphabetical order, the players are: Ayden Brey, Silver Lake; Tyler Dereskiewicz, Burlington; Viny Greco, Bristol; Jalen Hanford, Kenosha; Jalani Hudnall, Kenosha; Zachary Kazumura, Salem; Keegan Kearby, Salem; Chase Kerkman, Wheatland; Calahan Miles, Wheatland; Gage Peterson, Burlington; Drew Reiter, Bristol and Jake Roberts, Salem. Along with Steve Reiter, other coaches were Che Kearby and Rudy Greco. 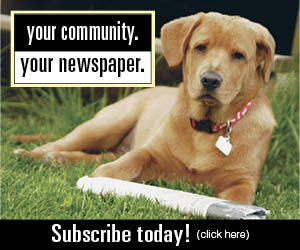 The Report will have more on their appearance, including reaction from players and parents, in next week’s print edition. 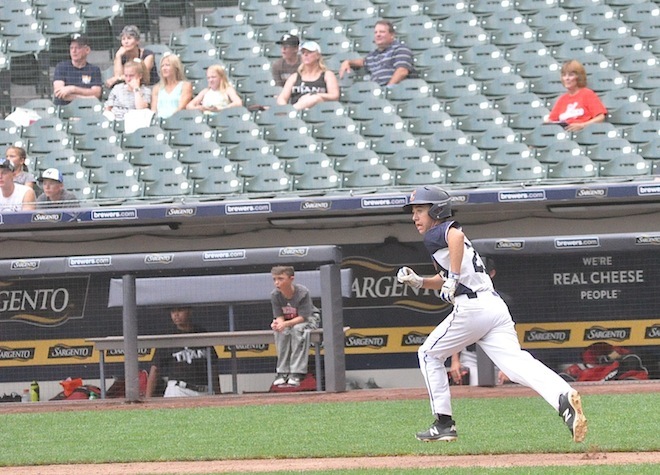 Viny Greco, of Bristol, makes a dash towards third base during Tuesday’s MYBL state championship. 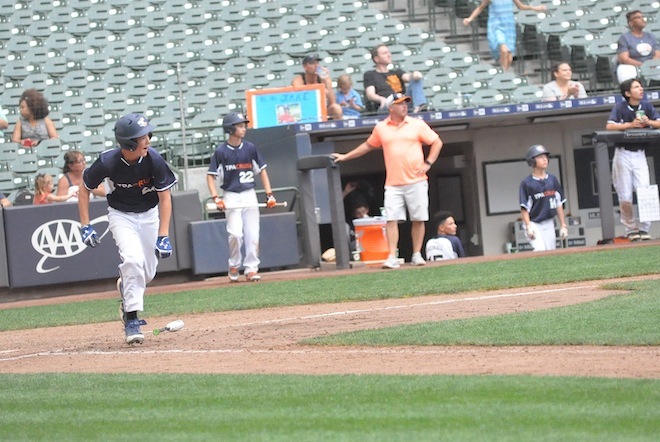 Chase Kerkman, of Wheatland, hustles to first base after receiving a walk. Gage Peterson (center) and Steve Reiter holds a discussion with an umpire at third base. Keegan Kearby prepares to launch a pitch to Titans Select. 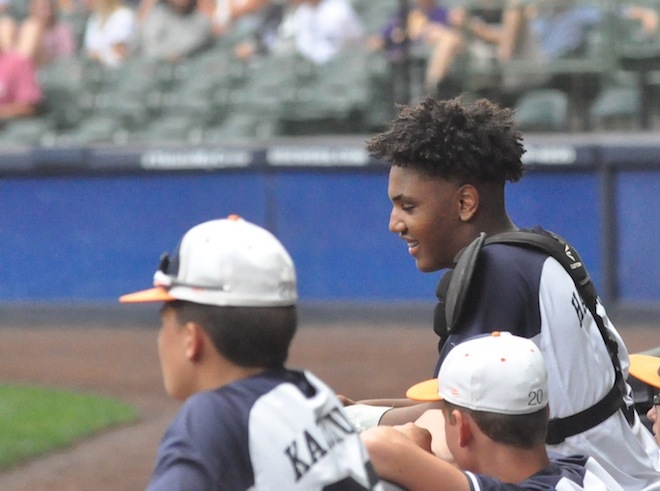 Jalen Handford, a catcher from Kenosha, smiles at the edge of the dugout at Miller Park. 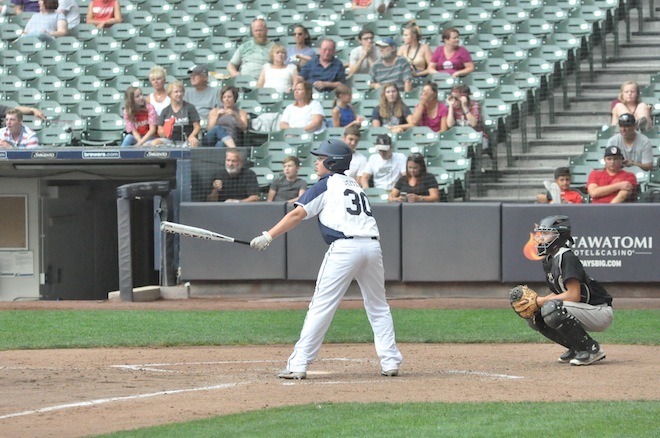 Calahan Miles, of Wheatland, legs out a fly ball Tuesday at Miller Park. 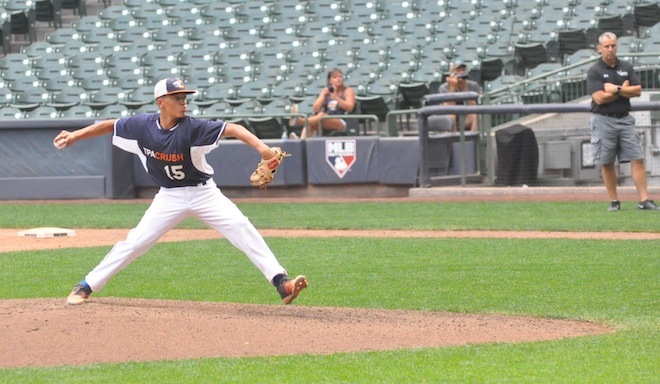 Jalani Hudnall prepares to toss a pitch at Miller Park. Zachary Kazumura awaits his pitch against Titans Select Tuesday at Miller Park. Jake Roberts hustles toward first base at Miller Park Tuesday. Drew Reiter patiently looks for his pitch in Tuesday’s game at Miller Park.